When you take a peek into my guest room you will soon realize that I have a soft spot for vintage beads, hats & clunky vinyl purses. I think the gal who gets the credit (or blame) for this collection is my dear sweet Grandma Maar, who had a flair for fashion. My Grandma, Teresia Maar immigrated to America in 1954 from Yugoslavia with her husband Rudolf and their six children, (my mom was six years old at the time). Their voyage across the Atlantic Ocean brought them through Ellis Island and the family made their way to Cleveland, Ohio where they settled and had one more child. I love looking at old black & white photographs of my Grandma in her younger years; although life was hard and money was tight, Grandma was definitely a woman of style. From my careful study of those old photos, I've learned Grandma had a thing for floral dresses, high heel shoes, scarves, hats and most definitely large strands of beads, clip-on earrings and rectangular shiny purses! Regardless of her fashions being second hand purchases from thrift stores, she was adorable as well as classy - all 4foot 11inches of her! 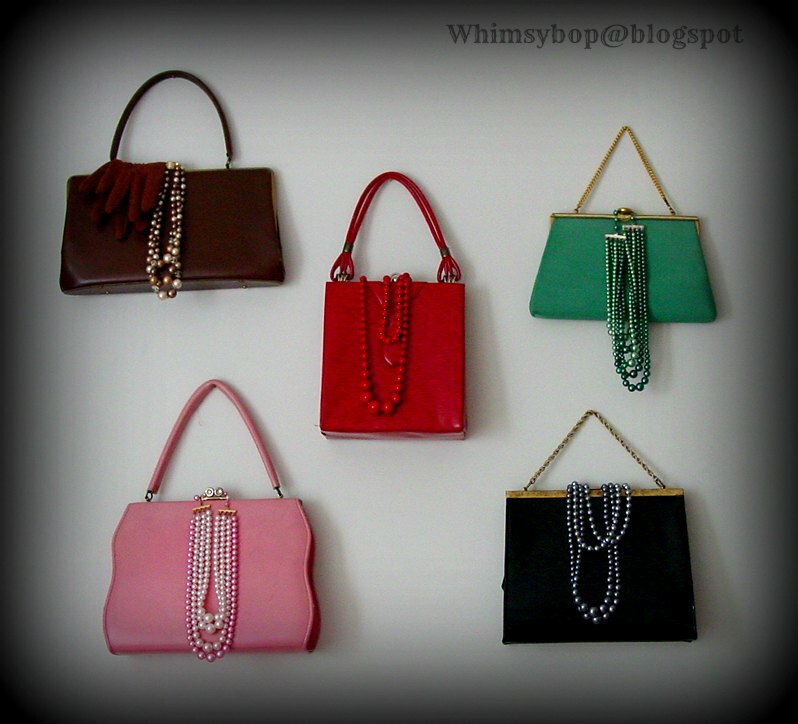 Sadly, no one in my family recalls where Grandma's jewelry, hats & handbags went to when she passed away. Through the years I've pieced together a small collection of items that could have been hers; things that were all the rage back in those "good old days" when ladies dressed up to go to church, the grocery store, out to eat, and even while vacuuming the living room carpet (a lesson taught by those classic tv moms of the 50's and 60's). I love scouring flea markets, antique malls and even Grandma's old stomping ground: the thrift store for all things old and sylish! Vintage beads are still fairly easy to find and you can nab a strand for about $3 to $20 depending on where you look. Hats and purses are more challenging to find, especially finding them in good shape; they tend to average between $5 - $45. I love showing off my vintage pretties in unique & unexpected ways. 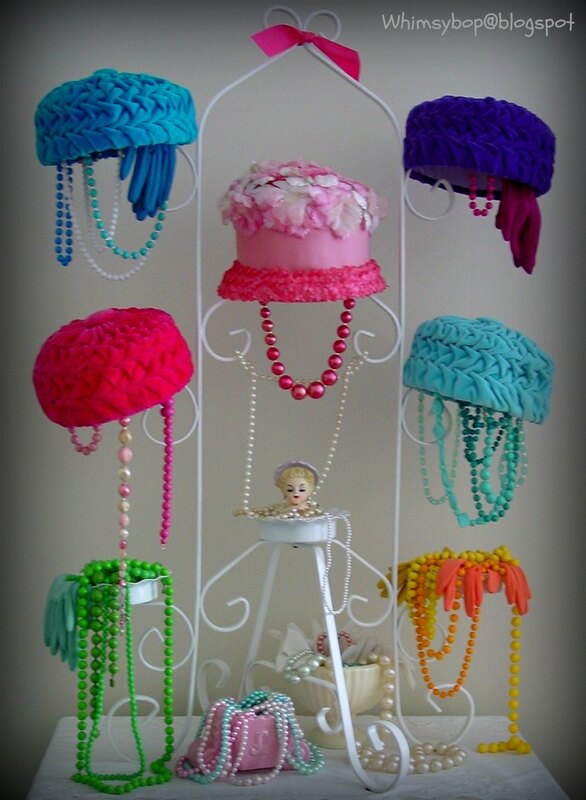 The old metal plant stand (shown above) painted white makes a great display for my collection of old hats. Purses are adorable attached to a wall with beads, hankies and gloves hanging from the clasp (I used tiny brass nails to hang them). 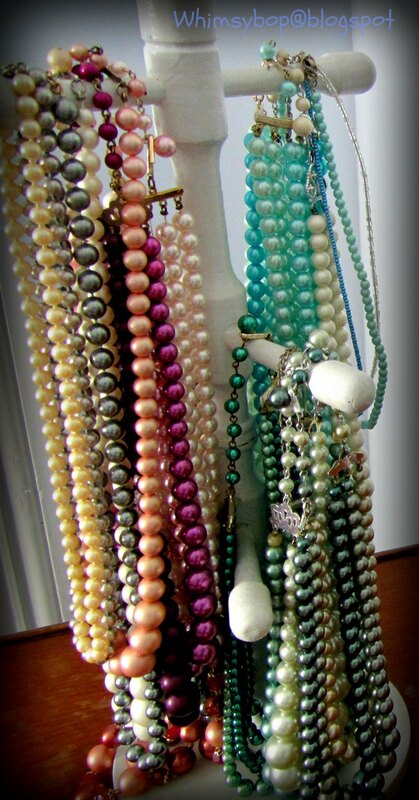 Beads look fun when dangled from an old coffee mug tree, piled high on a pretty cake stand, or placed in a beautiful bowl or in a special container such as an empty heart-shaped box of chocolates. When you dangle them from the side they look as if they're trying to escape and when they're heaped together in swirls of color they remind me of pirate's booty and of those sweet times when my children used them as props in their make-believe world of pirates, spies, knights and fairy tale princesses. Although the beads in my collection never belonged to my Grandma, there's something about them that makes me feel as if I'm connected to her and to women like her who lived in a world so different from my own. I am reminded of a generation of women who were ladies in every sense of the word; who knew that true beauty was just as much inward as it is outward, and who embraced their femininity and their roles as wives and mothers. As I said a few posts back - I grew up in the wrong era! 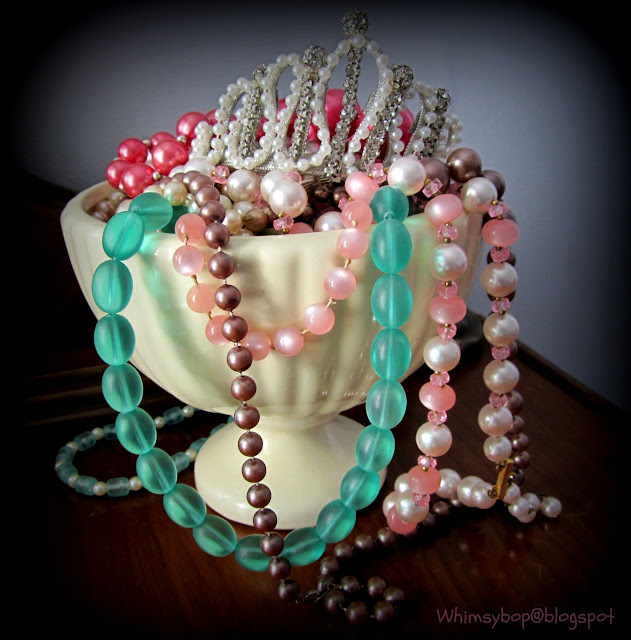 Oh well, what can I do except clasp some dangly beads around my neck and get out the vacuum cleaner!